DUG Insight User ManualFrequently Asked QuestionsFrequently Asked Questions LicensingWhy doesn't my floating licence work, even after a successful activation? A valid, successfully-activated, floating licence will not work if the software is unable to connect to the licence server, or is configured to use the wrong server. 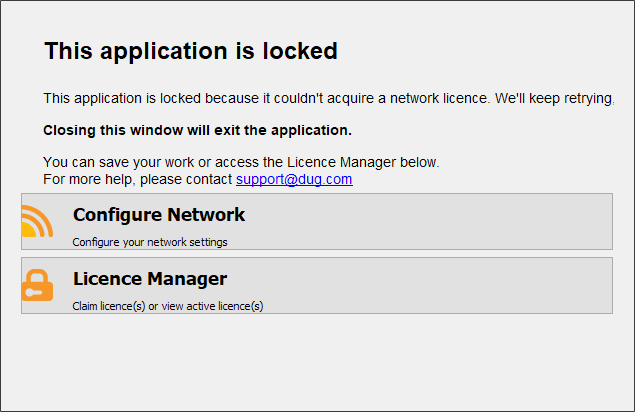 You may encounter error messages such as this, despite having successfully activated a non-expired floating licence. This can be caused by either incorrect proxy settings being entered after activation, or incorrect floating license server details. 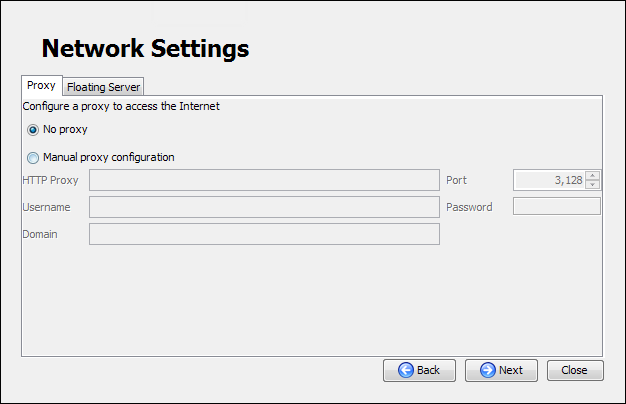 Click on Configure Network and ensure that the Proxy settings are correct. If you do not use a proxy, then ensure that No Proxy is selected. Click on the Floating Server tab to check which server you are using. The default setting is DUG's main server. 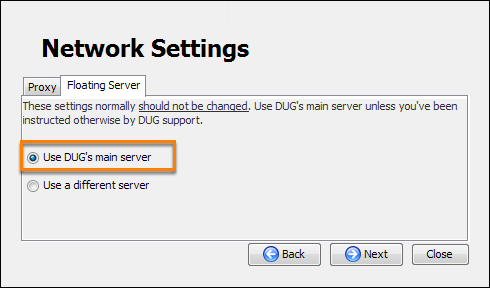 Unless you or your IT department has made a special arrangement to operate a local licence server, be sure that Use DUG's main server is selected. Otherwise, your licence will activate successfully but you will not be able to actually check out the licence and use Insight. Prev: How can I see who is using the floating licences? Next: What is the best way to copy and send DUG my project database?